Celebrities, they're just like us. If you thought the rich and the famous never had to worry about lowly things like autocorrect fails - think again. 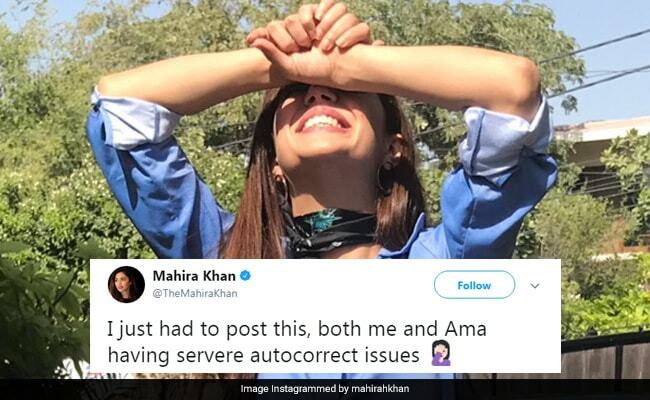 If Mahira Khan's latest tweet is anything to go by, the curse of autocorrect affects everybody from celebrities to their mothers. The Raees actor recently took to the micro blogging site to share a screenshot of a conversation she had with her mother. Though the two ladies were clearly trying to have a sweet conversation, autocorrect had other plans for them. According to the screenshot, it took Mahira three tries to get the correct word across. Meanwhile, her mother's response, another autocorrect fail, will make you laugh out loud. Since being posted on November 4, the tweet has collected over 8,000 'likes' and a ton of responses. Meanwhile, many noticed that Mahira's tweet about the spelling mistakes itself contained a spelling error. Am I the only person who is reading "Servere". Ever had a similar experience while texting your mom? Let us know using the comments section below.